Juan Pablo is a partnership between John Ramirez and Ginny Davis. Created to bring freshly prepared, plant based food with no additives or chemicals their venture comes after years of experience and interest in healthy eating. John's father was a native of Guam, a small island in the middle of the North Pacific. The islanders traditional Chomoran diet was based around fresh fruit, vegetables and sea harvest, and large family gatherings and sharing meals was central to the strong family based culture. John grew up inheriting his Fathers love of preparing and sharing food with lots of people and it is in honour of him that we took the name Juan Pablo which was his childhood name for John. After his global food experiences in childhood his formal Chefing experience started in the kitchen of renowned Restauranteur and Chef Kenneth Toye, who specialised in regional French cooking. Following on he then became Chef at long standing vegetarian restaurant Marno's in Ipswich, Suffolk. 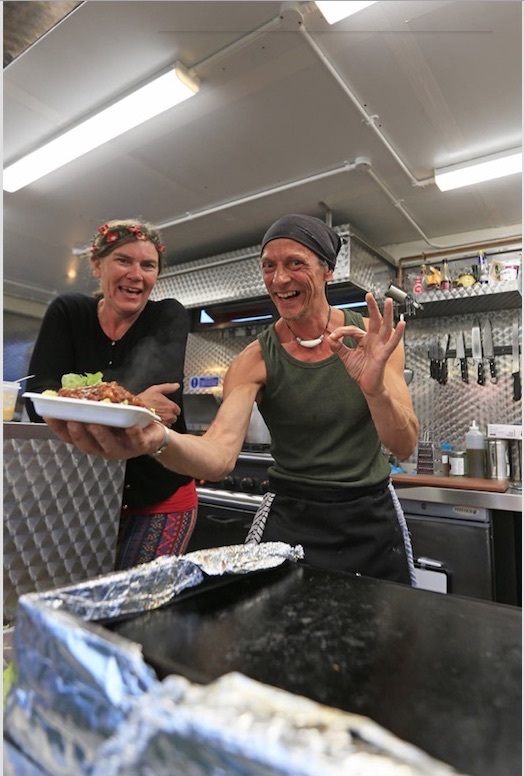 More recently he served as Catering Manager at Flatford Mill Field Studies Centre for ten years and currently works at the Rendlesham Peace Palace delivering Ayurvedic food. Juan Pablo is the ideal vessel for John to share his extensive experience and passion for good food. Ginny has always been interested in healthy food, her very first job was in a local Ipswich Wholefood cooperative. Discovering she had food intolerances in her twenties meant that the world of gluten/dairy and sugar 'free from' diets have become second nature and one of her aims is to ensure people who have food intolerances or dietary restrictions are offered a range of dishes they can have confidence in eating. In 2013 she completed a Certificate in Nutritional Healing which has informed her food choices ever since. We passionately believe that the earth should be treated with awareness and respect. Awareness of environmental issues underpins the principles of Juan Pablo. In our own small way we stand on a platform that seeks to place these considerations first. From using eco cleaners to sourcing organic or pesticide free vegetables as close to home as possible, using LED lighting throughout the trailer and cooking with British grown, non GM oil that is recycled at end of life into biofuel, we endeavour to bring as much good environmental practice to play as possible in the day to day operation of Juan Pablo.